ETC’s PLASA stand visitors queued up for demonstrations of the new ETC Source Four LED CYC last week. With the help of a desert scene cyclorama lent by the Design Realisation students on the Technical Theatre Arts programme at Guildhall School of Music and Drama, ETC’s fixtures product manager Jim Uphoff and colleagues showed how one scene can be dramatically changed to match different times of day. Five Source Four LED fixtures with attached CYC adapters at the bottom, and another five at the top, were controlled through an ETC Paradigm touchscreen to produce different colour mixes, each affecting how the scene was perceived. At London’s National Theatre, lighting director Neil Austin used a similar setup on Liolá, using Source Four CYC fixtures to create a very slow fade from cool blue daytime to warm orange evening lighting over the course of up to half an hour. Elsewhere on the ETC stand, staff were busy giving demonstrations of Eos Titanium and the new Cobalt 20, while visitors were able to enter a competition to win a Cobalt Nomad dongle – the Cobalt lighting system which can be operated from a user’s own PC. Cobalt has some keys available for future expansion, so ETC asked visitors for suggestions on what they think one of those keys should do. There were so many great ideas that one was picked at random. Winner Ross Jorge-Harman, a student at Rose Bruford College, suggested a sound wave button, which would show the wave form of the track currently playing at a concert or gig, so that it can replicated in light form. 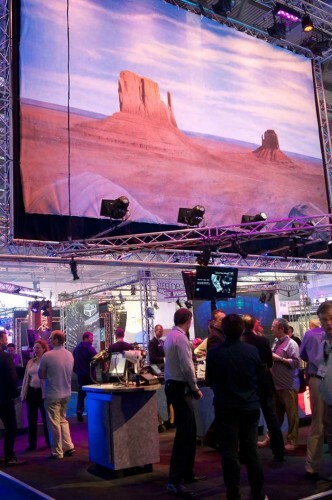 Visitors were overwhelmingly impressed with Cobalt’s operating style, which aims to bring users closer to their lighting, with a short command syntax, and touchscreen operation for those who prefer it.